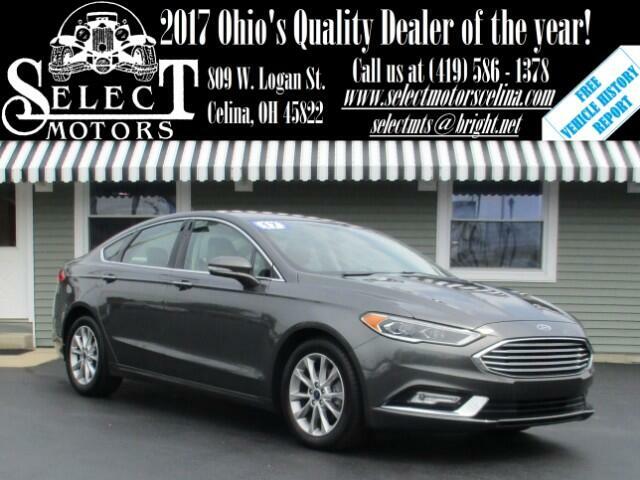 ***TXT US @: (419) 362 - 6200*** Heated Leather, memory seats, backup camera, dual power seats with power lumbar, automatic headlights, fog lights, compass, outside temperature, heated/signal mirrors, A/C, power windows/locks/mirrors, keyless entry with remote start, AM/FM/MP3, SiriusXM, auxiliary and USB port, steering wheel mounted audio controls, Bluetooth, tilt and telescopic steering wheel, cruise control, information center, 17" alloy wheels. Fuel Economy: 23 city / 34 hwy. Warranties: Balance of Ford's 3 year or 36,000 mile bumper to bumper and 5 year or 60,000 mile powertrain. In service date: TBD. Extended service contracts available. The Ford Fusion receives numerous upgrades for 2017. Among them are the new Sync 3 infotainment system, refreshed styling, a more useful center console design, an ultra-luxe Platinum trim level and a powerful new V6 Sport model. The 2017 Ford Fusion is a four-door, five-passenger midsize sedan available in five trim levels: S, SE, Titanium, Platinum and V6 Sport (late availability). The hybrid and plug-in hybrid (known as the Fusion Energi) are reviewed separately. The Fusion S comes standard with the 2.5-liter four-cylinder engine, 16-inch alloy wheels, automatic headlights, LED taillights, full power accessories, a rearview camera, cruise control, air-conditioning, a tilt-and-telescoping steering wheel, a height-adjustable driver seat, 60/40-split folding rear seats, audio and phone voice commands (Sync), Bluetooth connectivity, smartphone app integration and a four-speaker sound system with a CD player, an auxiliary audio jack and a USB port. Moving up to the Fusion SE gets you 17-inch wheels, LED daytime running lights, exterior keypad entry, an eight-way power driver seat (with power lumbar adjustment), a six-way power passenger seat, rear heat ducts, a rear center fold-down armrest and a six-speaker sound system with satellite radio. Optional for the S and SE is the Appearance package, which features 18-inch alloy wheels, foglights, a rear spoiler, a leather-wrapped steering wheel and special cloth upholstery. The SE is also available with the Luxury package (Equipment Group 202A), which adds the turbocharged 1.5-liter engine, LED headlights and foglights, keyless ignition and entry, remote ignition, an auto-dimming rearview mirror and driver-side mirror, heated mirrors, leather upholstery, driver-seat memory settings and heated front seats. Opting for the SE's Technology package equips the Fusion with rear parking sensors, dual-zone automatic climate control, an 11-speaker sound system, the Sync 3 technology interface (with an 8-inch central LCD touchscreen and two configurable gauge cluster displays), enhanced voice controls and an additional USB port. Select Motors provides a free vehicle history report on every vehicle, a complete 56-point inspection, a lifetime service loaner vehicle for $1 per day, and service after the sale. Select Motors also provides on-site assistance with financing, with rates currently as low as 4.15%*. We strive to provide our customers with the best financing rates available. What does 'No Hassle' mean? Select Motors does not play pricing games. We do not artificially inflate our prices in the hopes of winning a negotiation contest with our customers. We simply offer a low fair price up front to treat all of our customers fairly and with respect - which also saves you time and money in the process. Call us at (419) 586 - 1378 with any questions or concerns, or stop by our dealership at 809 West Logan Street in Celina, Ohio. We're here to help.